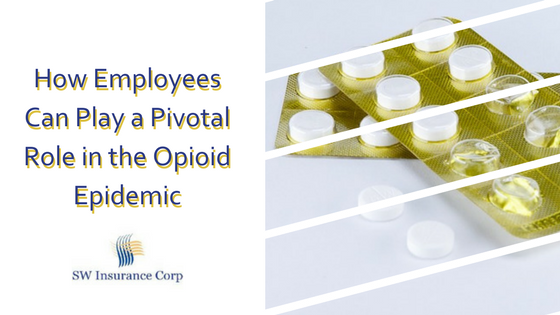 How Employers Can Play a Pivotal Role in the Opioid Epidemic | SW Insurance Corp.
With more than one in three Americans prescribed opioids in 2015, it’s no wonder that 64,000 people died from overdoses last year. The opioid epidemic is growing, and unless we do something about it, it’s here to stay. There is hope. Some key insurance companies are making changes in the way they do business. Employers can play a pivotal role in battling the opioid epidemic by delivering alternative solutions to their employees. It begins with choosing plans that limit coverage for opioids. Select health insurance plans offer treatment options for pain management that include physical therapy, steroid injections and nerve blocks. These more expensive options are necessary because they work to heal the body and/or manage chronic pain without the detrimental side effects of opioid addiction. Once you choose treatment alternatives, make sure copay options for these treatment plans remain low. If an employee has the option to pay $600 for a physical therapy session or $30 for a monthly dose of opioids, which do you think they’ll choose? If you keep the copays low, you give alternatives that will help them make the right choice without severely impacting their ability to support their family. Some companies are even offering access to physical therapists and behavioral health at no additional cost. Chronic pain is usually compounded by anxiety and depression. It’s hard to adapt to a life where you are more limited than you used to be. Combining prescription-free counseling and physical therapy can completely change the way we approach pain management. Look for insurance plans that offer medication-assisted therapy for those who take opioids. There are also health insurance options that offer case managers to help people (or their family members) who are recovering from opioid addiction. While higher healthcare budgets may seem daunting, consider the alternative. Opioid addiction costs companies over $18bn a year. Healthcare spending makes up about $8bn, while $10bn consists of costs to the company for absenteeism and lower productivity. For most companies, more than 40% of your overall healthcare costs are going to go to that 8% with the opioid problem. And this is just the beginning. The opioid epidemic is already affecting your company. By choosing a plan that covers opioid alternatives and management options for those who are already on opioids, you can change the landscape for your employees and the future of your company. You want great employees and spend a tremendous amount of time and money recruiting and hiring. In today’s world potential employees are looking at what YOU have to offer them in addition to salary. Also, what makes you stand out from other company’s in your field. Contact our office for a “no cost” 5 point review of your current Benefits Package or a consultation on what is involved in putting a Benefits Package together.